Me and the legendary Zimmerman twins - it's a friendship made in geek heaven. And it all started back when I worked for the NSA... My best friend Basia dragged me to the beach for her idea of a vacation. All those annoying people, sand in embarrassing places - not exactly R & R for a girl who doesn't like the sun, the ocean, or bathing suits. I couldn't wait to get back to work. But things started looking up when I ran into Elvis and Xavier Zimmerman. We discovered we had a lot in common: gaming, anchovies, hacking. After that, the vacation was perfect - until I accidentally broke some poor guy's fingers. Then Broken-Fingered Guy disappeared, and things got really dicey. With the Secret Service and a bunch of thugs suddenly after me, all I wanted was to solve the mystery and enjoy what was left of my vacation - preferably alive. 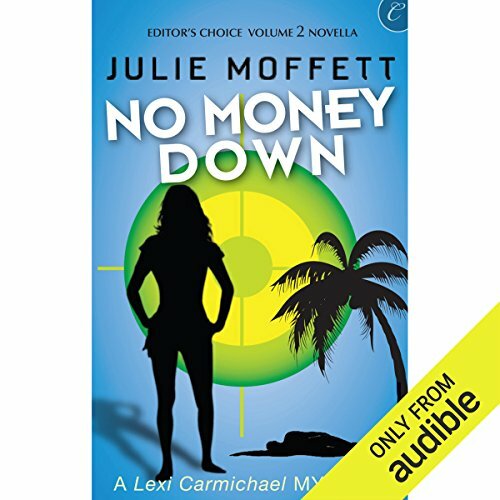 ©2012 Julie Moffett (P)2014 Audible Inc.
Would you consider the audio edition of No Money Down to be better than the print version? I never read the print copy. Yes, with the interaction between characters. Especially with the pouch that the guy left with Lexi. At first, I thought Basia had found a bomb, but then it was counterfeit money. When Lexi passed out, I thought the bomb had gone off and had knocked her out. I didn't know that she'd been injected with microchips. The entire listen (read) was a great success. Which character – as performed by Kristin Watson Heintz – was your favorite? Lexi, of course. And then Basia. Geek girl saves the day. Julie Moffett has outdone herself again with another Lexi Carmichael Mystery. I love the fact that Lexi is a down-to-earth kind of girl and not some overzealous beauty queen. She is unpretentious and open to the point of hilarity. I will always love these books because the character (Lexi) makes it possible. I love the Zimmerman twins so got me this was a great story. The narrator was excellent. I love Lexi Carmichael and her geek adventures. This is a short novella that appears between book 1 and 2. This is where she first meets up with the identical geek twins Elvis and Xavier. It is fast paced and enjoyable. Basia comes across as a bit naive but the story is good and nice to explain how the geek friendship occurs. All of these books about Lexi are terrific.